"Setsubun" could literally be translated as "a separation of seasons" or "the beginnings of each season". However, Setsubun has specifically meant the beginning of spring since the Edo Period. On the evening of Setsubun, people throw roasted soy beans (Fukumame) outside of their houses while shouting "Demons out, good luck in!" This ritual is believed to drive bad luck out of people's houses and welcome the good luck in. People also eat the number of beans equal to their age plus 1 for good luck and health. Many shrines and temples all over the country have Setsubun ceremonies and usually people born under the same Chinese Zodiac sign as the current year are chosen to throw the beans. The traditions are slightly different depending on where you reside, but the standard way of doing Setsubun is listed below. 1. Fill a wooden dish (fukumasu) with roasted soy beans and place it on Kamidana (household Shinto altar) over night. 2. On the evening of Setsubun, throw the beans!! 3. Open the window or the door of a room → throw the beans outside and shout "Demons out!". Close the window or the door of the room → toss the beans twice inside of the room and shout "Good luck in!" 4. Once you finish throwing the beans, eat the number of beans equal to your age plus 1. If you do not want to eat the beans, you can put them in a green tea and drink them as well. Mizusawa Kannon/Temple, the 16th checkpoint of Bando Sanju Sankasho, holds an annual Setsubun ceremony. A man and a woman who are born under the same Chinese zodiac sign as the current year are chosen to throw not only the beans but also some candies to the audience. The temple also gives people raffle tickets for prizes. February 3rd, Thursday * The event will be canceled due to a bad weather. 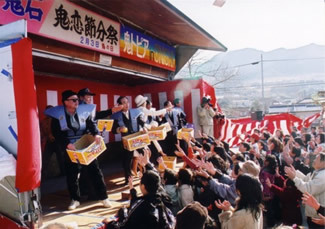 Mikagari Shinji (Setsubun event) started more than 180 years ago. The huge bonfire at the center is the event's most famous feature. 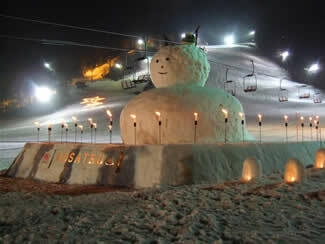 The fire festival will be held in Kitakaruizawa Fureai Hiroba this year! More than 4,000 candles will be lit during the ceremony. 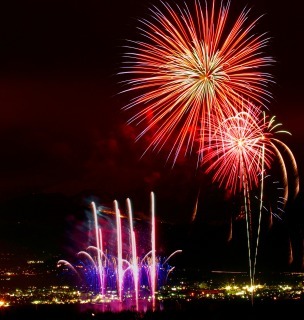 There will be a Japanese drum performance and fireworks at the event. Come and enjoy the snow wonderland! More than 1,000 candles will be lit in the ski area! February, 26th Sat. – 27th Sun. Here is the list of spa resort hotels and Japanese inns in Gunma. Winter festival in Showa-mura/village is filled with many fun activities for both adults and children! Shishi-Mai or Lion Dance has been performed at this Shrine in a ritual which began 300 years ago. This event takes place on February, 11th annually as a part of the spring festival.